The monitoring and evaluation (M&E) process is turning into a spry new creature with technology. With increasing emphasis on real-time feedback, more rigorous data collection, and quantifiable results, the spread and use of Information and Communication Technologies (ICT) in monitoring and evaluation — ‘ICT4M&E’ in short — has sparked massive interest, particularly in the Global South. However, despite clear benefits of integrating technology into the M&E process, this has yet to catch on in a big way. Industry professionals are still experimenting with where and how technology can be placed into existing M&E frameworks. They are also grappling with the wide variety of technologies and a lack of clarity on what benefits technology might bring to development projects. To help answer this, we have compiled a list of 5 broad ways in which ICT can help improve the M&E of your development project. Monitor and track the performance of all your projects on a single software platform. Click here to learn more. Reducing costs in development programs is of utmost importance. Limited amounts of funding in the international development space means that money saved in monitoring and evaluation can go to increase your program’s impact. The use of ICT can bring down the M&E cost considerably. Mobile data collection is one of the easiest technologies to adopt for M&E. Using cell phones to collect data reduces the costs of creating paper forms and data entry. The World Bank found that mobile data collection reduced costs for each survey by an average of 71%. According to USAID, mobile data collection also lowers the time taken to run a survey by a huge 70%; a decrease in time and increase in efficiency obviously means reduced costs. Collecting data electronically reduces data-entry costs and makes the information easily accessible faster. Also, since the data reflects in real time, survey administrators can react faster to their M&E exercises. Areas of concern, waste, and inefficiencies can be identified and addressed faster, making programs more dynamic and cost-effective – all in real time! Catching errors in reading or entering data in pen-and-paper survey and data collection systems is incredibly cumbersome. According to USAID, the measures for data accuracy are validity, reliability, precision, integrity, and timeliness – and here’s how technology can help with those. Real-time data validation helps to weed out measurement errors and increases accuracy significantly. In-built data validation prevents erroneous data from entering your system in the first place. This helps to ensure that data is valid and reliable. Data entry errors occur at the time of data collection or when it’s being transcribed. Technology allows single-point data entry to reflect across the system. There is more — survey administrators can track where seemingly inaccurate data is coming from, flag it, and have it collected again. This makes data more precise and reliable. Data security ensures that your data is not manipulated or lost. Using pen-and-paper data collection puts your data at risk of being lost, garbled, or manipulated before the program manager even takes a look. Technology can help put in processes that track data from the time it is entered. This ensures data validity, precision, and integrity. Advances in technology have fundamentally changed the kind of data collected for M&E, and how we use it. Collecting data in multiple formats and forms opens up immense potential in getting richer data from your development project’s monitoring and evaluation. Location and GPS data has become more accessible with the use of location tracking on cell phones. This makes it easier to collect follow-up data, helping you to make connections and draw insights better, and verify the source and credibility of your data. Reaching out to different groups in society and engaging with them in their own natural language enriches your data greatly. You collect more accurate and holistic data when questions are in the language used by respondents. Multimedia data means adding images, video, and sound to your traditional data. 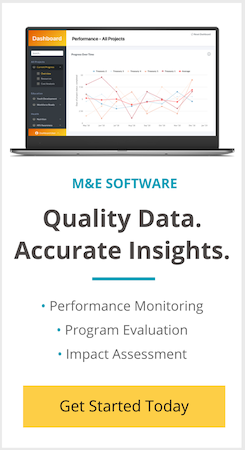 Collecting M&E data in such a form not only makes verification easier, but it also increases the quality of your data. Most importantly, it provides a human element to the M&E exercise. ICT in development programs break down the boundaries that existed in communicating lessons and results with the development world. With the creation of this global network, which is seeing far more participation and access in the Global South, there are huge benefits that technology can bring to development programs and their M&E. Scalability is one of the most intrinsic benefits of the use of technology. For example, there is only a marginal cost in additional people taking a survey once it has been created. Development programs and their M&E can therefore be scaled up now quickly at minimal cost. Taking up development projects in remote locations no longer means spending on expensive travel or investing human resources at the project location for long periods of time. Managing and monitoring projects can be done remotely. Promoting awareness and feedback related to development projects has never been easier. Project managers now can get direct feedback from the community about their projects, thanks to mobile technology. This new platform eliminates the potential biases of M&E teams by aggregating large amounts of data in real time, enabling them to have a finger on the pulse of their program. Technology can clearly make M&E easier and improve data collection accuracy while reducing costs. But, more intriguingly, technology can also assist in the process of learning from the M&E process. Using analytics, visualization, dashboards, and mapping can enhance your ability to make sense of all the data that you collect for M&E. Visualizations of your monitoring and evaluation data can help you understand and consume your data more efficiently. Good visualizations in interactive dashboards can help convey important data points and help you arrive at the right conclusions about your M&E process — something spreadsheets of data might not help you with. Geospatial mapping your development project to understand its geographical footprint will help you gauge patterns and develop deeper and better understandings of your target audience. This is especially useful for M&E on projects related to sustainability, health, nutrition, development, sanitation, and much more. Analytics can help you measure your results and make you more data-driven. Depending upon what your project goals are, you can optimize your program to achieve those results. Analytics can help you plot the roadmap to that end goal by helping you realize what inputs will get you that result. Clearly, there are great advantages to integrate ICT into your M&E. Saving money, adding value and impact to your project, and gaining insights to improve the project’s future – what’s not to like? Not On the Kotlin-Android Bandwagon Yet? This my first time to see this site and I really found it most usefully. As a head of HMIS/e-Health at State Ministry of Health, I will be more delighted to join to be receiving this post regularly and also participate in trainings. Best thing is simplicity and lucidity of thoughts rather than elaborate research articles putting you to sleep. Many insights in few lines. I have been into M & E from about 15 years now, and mobile based M & E for about 5 years. I really found your post covering some major points in digital M & E. Many Thanks! It might be a good idea (for other readers) to also mention free mobile based software like ODK Collect, which allow you to collect and export data into Excel and Google Sheets. Tons of YouTube videos on how to do this! What would the cost of the soft wear be. Is it applicable to mobile App. Hope to hear from you.